The Mueller Report from Special Counsel Robert S. Mueller is highly anticipated in both the political and publishing realms. Scribner and The Washington Post already have a book scheduled called The Mueller Report. The publishers say the book will contain the findings by Mueller and the Posts' reporting on the Mueller investigation. There are many unknowns with the Mueller investigations. These unknowns include the release date of the report itself and whether or not it will even be made public. Congress recently voted unanimously to make it public but no one outside of Mueller's team knows when it will be released. The release from Simon & Schuster notes that the details of Mueller's findings will only be included in the book if they become public. There have been recent reports that President Trump could try and claim executive privilege to keep some or all of the information from becoming public. If the report is bad for the President he may try and stop the report from coming out. This could result in major legal battles in Washington D.C. The Washington Post executive editor Martin Baron says in the announcement, "We are at a supremely important moment in American history. The Post has dedicated vast reporting resources to the Special Counsel's investigation and the events that led to it, and we are now proud to join with Scribner in providing context and perspective." Mueller certainly has everyone in the publishing world waiting for his report. 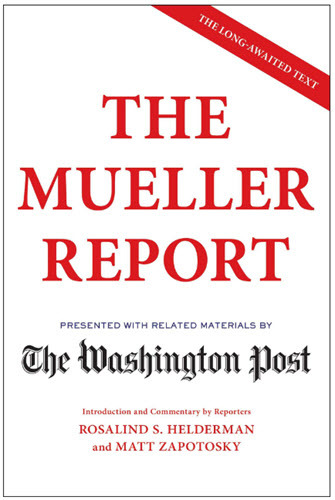 The listing on Amazon.com for the release of The Mueller Report from The Washington Post is April 30, 2019. That date could certainly be tweaked if the report from the Special Counsel is not available until this summer. Simon & Schuster also says, "The Special Counsel's investigation looms as a turning point in American history, which will make The Mueller Report essential reading for all citizens concerned about the fate of the presidency and the future of our democracy."